Zazu Salon and Day Spa is located at 18 E. Hinsdale Avenue in Hinsdale, 630-325-8126, zazusalons.com. The doors at Zazu Salon and Day Spa opened in Hinsdale in 1979 with four chairs and only a handful of stylists. At the time, there was little to do in downtown Hinsdale—and definitely no other salons. Now nearly 37 years later, Zazu hasn’t just maintained its reputation for exceptional customer attention and salon and spa services. It has grown that reputation—and its business. 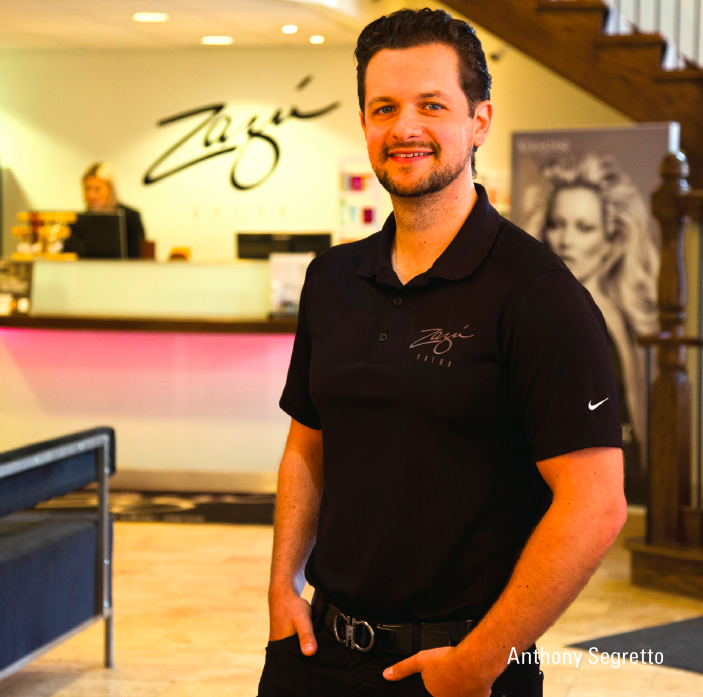 The Hinsdale salon has grown from four chairs to 25, and more than 50 hairdressers come in and out of Zazu on a given week to serve clients. Zazu has grown beyond Hinsdale as well, with locations in Naperville, Wheaton, and downtown Chicago. “We also opened a men’s store in Hinsdale, the White Buffalo Barber Shop. This is a new venture for us,” Segretto says. More growth is on the way, as well. A remodeling project began this summer at the Hinsdale salon, which will add 10 more stylist chairs, revamp the entire nail department, and remodel the hair side of the salon and spa. The project is expected to last six to eight months. Zazu’s Chicago location also is growing fast, and it’s moving locations for more space (upgrading from eight chairs to 15). So how does a salon stay at the top of its class in an industry that continues to see more and more competition every year? “We take a lot of pride in the experience we try to create for everyone coming in the door,” Segretto says. “This has always has been the focus of our business. Both Susan and Salvatore are stylists and remain in involved in the business, as do Anthony’s two brothers, who serve as CFO and CIO. In addition, two of the original employees that started at the Hinsdale location in 1979 remain there today. Zazu is a full-service salon and spa, known throughout the industry for its hair services. “Any coloring technique you can find online, in books or through Instagram, we can do. There is nothing anyone can find that we don’t already do,” Segretto says. This has a lot to do with the education of Zazu’s staffers who go through a rigorous training program, often traveling to leading fashion destinations across the world including Milan, Barcelona, Paris, London, New York, and Los Angeles. “We don’t departmentalize,” Segretto adds, meaning Zazu stylists are trained in both color and cutting, which is beneficial to the client to not have to be passed around to various stylists. Segretto says the salon’s skincare and blowout services are also top of the line. “We are in the tightest and highest of circles when it comes to beauty and fashion,” Segretto says, but that doesn’t mean customers are priced out completely. Zazu employs a number of young designers, too, who are a little less experienced and provide services at lower a cost. Still, they are “driving trends in a way we haven’t seen before,” Segretto says. This post was sponsored by Zazu Salon and Day Spa. It is located at 18 E. Hinsdale Avenue in Hinsdale, 630-325-8126, zazusalons.com.